60% of typical readers make it to the 1200th pixel. Facebook comments and Tweets don’t correlate to whether that person has completely read the article or whether the content is really good. I learned that the typical browser window is 700 pixels tall, so if a reader scrolls one more time (which would be about 1400 pixels, you should finish your post in that “second window.” You may have a lot more to say and want to do a nice wrap-up, but most of your readers are still with you at this point and many will not stick around if they need to scroll again to continue reading. The length of your blog post matters. I also recommend the e4e post on Why Layouts Are Important for web design. I recommend you take the time to read You Won’t Finish This Article, too. The author, Farhad Manjoo, takes what looks like a dry topic and makes it entertaining, so don’t bail because it’s two pages long. Look for the information that will help you with your blog posts or other web content. 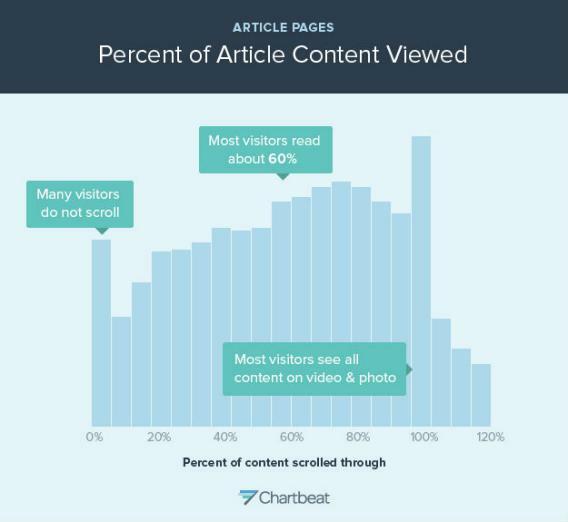 The chart is included in the Slate.com article and is from Chartbeat.